The Central Coast has exploded with grapes, small organic farms, world class restaurants and interest in quality healthy dining. John Henigin learns along with you about what we fortunately are able to enjoy. 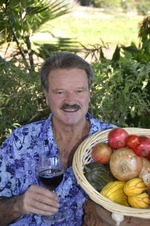 John has some experience in the food and wine business, as restaurant owner, boutique wine distributer, and caterer. Catch some of the interesting developments in local produce and agriculture, hot new restaurants with creative chefs. Unwind as we take you into some of the top vineyards on the Central coast. Our colorful and stimulating interviews go beyond the ingredients and the grapes and more into the people behind the masterpieces with no “Wine Speak”. Healthiest and most delicious food and wine is in our own neighborhood.